A common question asked of security professionals is, how long does it take to crack a safe? The answer? As long as it takes. Given time, thieves will find a way into a safe. The solution? Don’t give them the time. In other words, don’t allow the opportunity for a thief to take a safe away. Investing in a safe is a wise move. However, unless you actually secure that safe, you could be wasting your time, and your money. Do a Google search for ‘safe stolen’. Amazed at the volume of results? 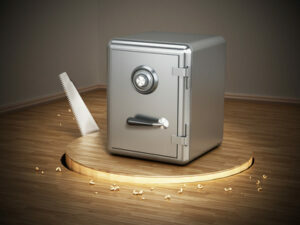 Safes are stolen from properties all the time, regardless of their weight or size. All thieves need to crack a safe is time, so if they can get that safe away from prying eyes and the risk of a returning homeowner, there is every chance they’ll be able to get in and help themselves to the contents. Why bolt down a safe? The importance of bolting down a safe cannot be stressed enough, and that goes for even the heaviest models. Thieves will always find a way to remove a safe if they think it will be worth the effort, in fact there are plentiful stories of exceptionally heavyweight safes being carted off premises and loaded into vans. Not only is it crucial to bolt down a safe to prevent it being removed, it will also protect you should you need to make an insurance claim. Most insurance providers will stipulate that if you are intending to protect valuables and/or cash in your home using a safe, then it must be professionally fitted to a wall or the floor. You can of course fix the safe in place yourself, and most models will incorporate anchor points and come with a fixing kit. Some insurers will accept a DIY installation, but you should check the specific requirements of your particular provider. Let’s take a look at some commonly asked questions about fixing a safe. What can a safe be fixed to? The best thing to bolt a safe to, in an ideal scenario, is a concrete floor. Wooden floors are also acceptable, although you will need to make sure your fixings hit a joist or that you use coach bolts. Strong adhesive, such as 3M high performance adhesive, can also be used, but bear in mind that this will make the installation permanent. What are the benefits of fixing a safe? Safes are a natural deterrent, but on coming across one, the first thing a thief will attempt to do is move it. If the safe doesn’t move, the thief will give up straight away. Most thieves will not stick around to try and access a safe, especially a high security one. Therefore by fixing your safe down, you will be adding another layer of protection to your security armoury. Are there any considerations when fixing a safe? If you fix a safe using a permanent method such as a strong adhesive, then you will lose the option to relocate it either to another room or when you move home. If you are renting a property then you will need to request permission from your landlord if you wish to permanently fix a safe. Drilling holes in walls and floors is usually outlawed in tenancy agreements, and obviously gluing will make a safe a permanent fixture which a landlord may not want. Considerations aside, the benefits of securing a safe to a wall or floor are significant. If you are looking to purchase a safe for your home or business premises, talk to Barry Bros Security. We can provide you with tailored advice on selecting the best model to suit your individual needs, and we also offer a professional safe installation service.